Lord Archibald Campbell (1682 to 1761), created Earl and Viscount Islay in 1706 and sardonically nicknamed the “King of Scotland” because of his powerful influence on Scottish affairs of state, was a man whose interests tended towards the natural sciences rather than the arts. He was also a keen gardener, skilled in the cultivation of exotic plants. Born at Ham House - the seat of his maternal grandmother, the Countess of Dysart - in June 1682, he was educated at Eton, Glasgow University and Utrecht University before entering the army and serving under Marlborough. On leaving the army he entered politics and held several posts in Scotland. In 1722 he acquired about 40 acres of Crown land on Hounslow Heath, adjoining the hamlet of Whitton and on 6th March 1725 he wrote to Lord Milton “I am going out to Whitton…You know I live in the Garden.” This wild, uncultivated area was a daunting challenge to any would-be horticulturist. Nevertheless, Islay set about planning his estate which he laid out in two separate sections, situated respectively to the west and east of the road leading north to Hounslow. The smaller, eastern section was a nursery. An octagonal Chinese summerhouse was the only building of interest erected on the part of the estate. The larger, western section was the main enclosure, an irregular square of some 1,300 feet surrounded by a drainage and irrigation ditch fed by streams which were artificially controlled by a wind machine. The main enclosure was again subdivided into two distinct western and eastern parts. To the west was a densely wooded area broken by winding paths and separated from the eastern area by a broad walk. The eastern area contained the formal gardens, ornamental waters and chief buildings. One of the first buildings to be erected was a large greenhouse, 80 feet in length with a hipped roof and an open rusticated loggia of five 10-foot bays. It was built in 1725 to 1726 and designed by James Gibbs, whose Book of Architecture (1728) includes designs for three other buildings proposed for Whitton Park, but never executed. The greenhouse stood at the northern end of an artificial canal which was situated near the centre of the main enclosure. At the southern end of this canal was a triangular gothic tower with angle turrets. Gibbs may also have been the architect of this building. Unlike many of his contemporaries, Islay did not, apparently, consider it a priority to build a palatial place of residence for himself. His villa at Whitton Park was not completed until the 1730s and he was content to live in a gardener’s cottage on the estate till it was ready. The design of his small but elegant villa, known as Whitton Place and situated in the eastern part of the main enclosure, has been attributed to Roger Morris. Morris was the architect who had collaborated with Henry, Lord Herbert, on the design of Marble Hill, Twickenham, built for Islay’s friend, Henrietta Howard. Whitton Place was 45 feet square and designed like a rudimentary Greek cross, with a low pedimented projection on the east and west sides and a canted bay with a balustrade on the south face. Tuscan colonnades extended from the east and west faces and were terminated on each side in office blocks. The interior had ceiling paintings by the French artist who also worked at Strawberry Hill and Radnor House. In 1743, Lord Islay succeeded to the title of Duke of Argyll on the death of his elder brother, the 2nd Duke. According to J.C. Loudon in the first volume of his Arboretum at Fruticetum Britannicum (1854), many of the exotic plants from Whitton Park were transferred to the Royal Botanic Gardens at Kew after the 3rd Duke’s death in 1761. 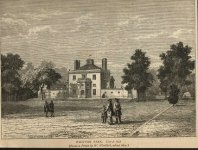 In 1765 a Mr Gostling purchased the estate, converted the greenhouse into a mansion and resold Whitton Place to Sir William Chambers who made various alterations and added garden buildings such as the “Temple of Aesculapius” which existed until as recently as 1901. Whitton Place was demolished about 1847 and the converted greenhouse and gothic tower remained until the early 1900s.